Security Camera DVR’s – Which one is right for you? The DVR is commonly used or mostly used as a recording device for Video surveillance, some DVRs have Audio Inputs (almost everyone now days), but your unit also may come with extra outputs to execute actions like turn lights on, unlatch doors, open the garage of your house, etc.These outputs are located in the back of your DVR, and can be NO (Normally Open), or NC (Normally Closed). The NO output (Normally Open) means the initial state of the output position before activation, in this case there will be no continuity between connection points while the output is not activated; once the output is energized, there will be continuity between both connection points. 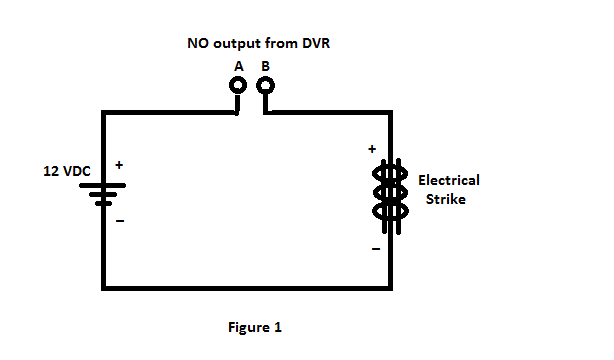 Normally Closed output has the inverted effect, meaning there will be continuity between connection points while the output is inactive, and once the output is active it will be no continuity between the connection points. Keep in mind that these outputs are no power supplied, meaning they don’t supply power from the contacts, so you can use them as contacts to control external powered circuits; also, this contacts have certain tolerance, from 0.25 to 2 Amps, depending on the model of your DVR and the type of voltage you are using. These outputs can be used for different applications like turning lights on or off in front or back yards, operate garage doors, temporarily deactivate or activate sensors like motion detectors or door switches. Best of all, these output can be program to interact with the cameras, for example you can activate an output every time the camera motion detection is activated, so if the camera detects movement, automatically will activate the output, and if you are trying to protect an area (for example, your backyard) you can connect a 12VDC relay to one of the outputs of your DVR, to energize a loud horn, so it will scary anything away, or if you may want to allow your pet to get into certain area of your house ( example given, the screen patio, or Florida room) you can have the output deactivate the motion sensor or the door contact of your alarm for this area, so it won’t activate the alarm. Because of the low amperage resistance and the limited voltage capability of these outputs, they cannot be operated on circuits of more than 24VDC, and cannot be operated in AC voltage. 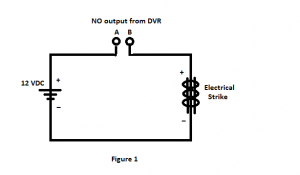 The good news is that if you need to control an AC powered circuit with one of your DVR outputs, you can do it by using an External 12VDC or 24VDC Relay that can handle AC voltage on its contacts. The connection is a little bit more complex, but you still saving money by using the outputs on your DVR, instead of buying expensive controllers. For instance, if you want to control the garage door at your house, the first thing you need to do is check the garage door controller manual to find out if the openers are 12VDC, 24VDC or 24VAC operated control circuits. 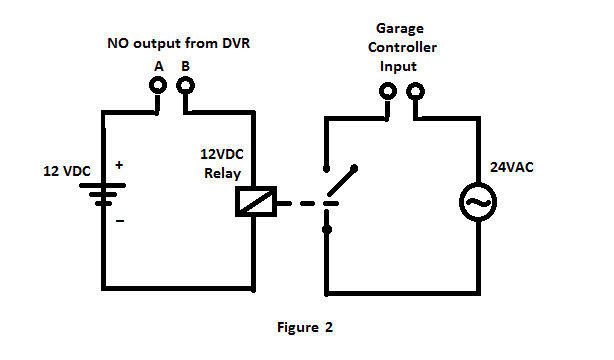 If they are 12VDC or 24VDC operated circuits, you can used a 12VDC or 24VDC External Power Supply, and the same circuit show on figure 1, but you will replace the Electrical Strike for the points of connection for signal input at your garage door controller. 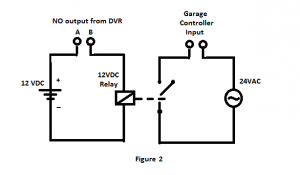 If you garage door uses 24VAC for the control section of the garage door, you will need to get a 12VDC Relay that can handle AC voltage on its throttle, and a 24VAC Power Supply, to supply the voltage needed to control the garage door (see figure 2). One of the most interesting applications I have seen using these outputs, is the utilization of one of these outputs to control the activation and deactivation of an AC system inside an office, where the AC unit will activate only if the camera see motion detection on the entrance of the building, and will give a deactivation signal after certain amount of time, by programming the temporizer in the thermostat of the unit, or if the DVR comes with the option, give certain amount of activation time to the output. Some DVRs are also equipped with Alarm Inputs, which give you the option of adding devices to activate alerts and buzzers on the DVR, or you can redirect these inputs to activate an output, every time the device connected to the input of the DVR (example, motion detector) activate this input. Just like the Domestic Burglar and Fire Alarms now days that come with Video and Audio Inputs, to connect cameras and microphones over the Alarm system, like Comcast Home Security Systems, the DVR gives you the option to connect no only Surveillance Cameras, but Motion Sensors, Door switches and contacts, microphones, and it gives you alerts every time one of these devices is activated. Our DVRs come with these particular outputs, and one of the biggest advantage we have, is the ability to control these outputs over the network, so you can execute actions anywhere you have your computer or laptop, and an internet connection. It is also available in the Apps used on your smart-phone, so these outputs can be controlled anytime, and anywhere with a touch of the screen on your mobile device.